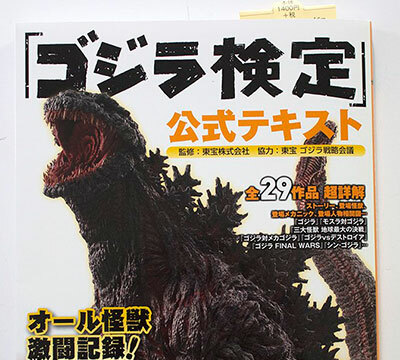 It has been several months since the announcement of the Godzilla Certification and the release of the Godzilla Textbook (「ゴジラ検定」公式テキスト Godzilla Certification Official Textbook) with studying and practice for the examine. Reminders about the coming exam have been tweeted out. For those of us who cannot be in Japan to take the test, we can at least try the practice questions from the study book. So let’s get started. Here are the five practice tests for the elementary level. It was the release date of “Godzilla” (1954), and in 2017 it was the month and day which was certified as “Godzilla Day” by the Japan Council. What was the date of the certification? 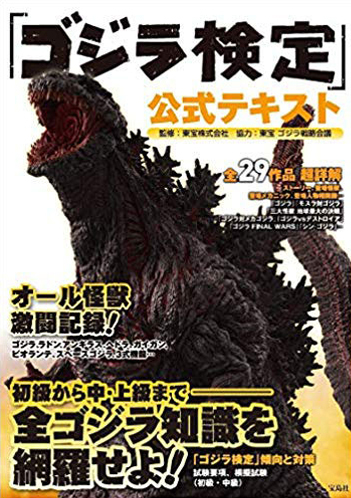 Since the first film, who played Godzilla in much of the Showa series, who was memorialized at the 90th Academy Awards held in 2018? Which of the following is a science weapon in “Godzilla” (1954), invented by Dr. Serizawa, and destroyed Godzilla? Who served as the director of “Godzilla” (1954)? Which was the opponent in ”Godzilla Raids Again“ (1955), the first in which Godzilla battles and opponent? Which of the following islands is said to have a legend of the monster “GOJIRA” in “Godzilla” (1954) and in “Shin Godzilla” (2016)? Which one of the following creatures became the motif of Mothra? Which one of the following monsters faced King Ghidorah with Godzilla and Mothra in “Ghidorah The Three-Headed Monster” (1964)? What is the correct number of King Ghidorah’s necks? Which of the following is the name of the company that will appear in “Godzilla vs The Sea Monster” (1966)? Who is the actor who played Hideto Ogata in “Godzilla” (1954)? 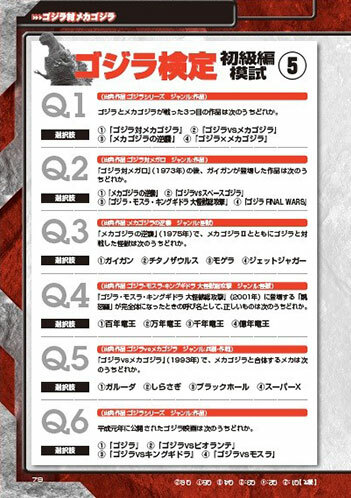 Which of the following drinks does Shuichi Izumi offered to Rando Yaguchi who lost his cool during “Shin Godzilla” (2016)? What is the name of the plan to control the weather of Sol Gel Island in “The Son of Godzilla” (1967)? Which one of the following monsters appeared in “Son of Godzilla”? In “Godzilla” (1954), Dr. Yamane was inferring Godzilla as one of the prehistoric creatures. In addition to humans and Godzilla, Biolante was made from the cells of certain plants. Which one of the following plants is that? Who are the actresses who played the US presidential envoy Kayoko Anne Patterson in “Shin Godzilla” (2016)? In the movie “Shin Godzilla”, where is Godzilla stopped with the blood coagulation? Which of the following is the monster headed towards Godzilla in “Destroy All Monsters”? Which of the following social problem was handled in “Godzilla vs Hedorah” (1971)? Which of the following theme songs belongs to “Godzilla vs Hedorah”? ② かえせ！太陽を Save the sun! Which of the following shooting centers was used for shooting the Godzilla series? Which one of the following is wrong with “weapons mechanics” activated during “Sin Godzilla” (2016)? Which of the following is the third work that Godzilla and Mechagodzilla fought? After “Godzilla vs Megalon” (1973), which of the following works did Gigan appear in? Which of the following monsters competed against Godzilla in “Terror of Mechagodzilla” (1975)? Which of the following is the correct name of “Wei Ruola” appearing in “Godzilla GM” (2001)? In “Godzilla vs Mechagodzilla” (1993), which of the following mechanisms combines with Mechagodzilla? Which of the following is the Godzilla movie released in 1989? In “Godzilla” (1984) Which of the following is the weapon equipped with Super X that appears during the work? In “Godzilla” (1954), what is the correct one among the combinations of people who dive in the sea to defeat Godzilla? Where did Jun Kunimura who played the integrated staff director in “Shin Godzilla” (2016) appear before “Shin Godzilla”? “Godzilla” that appears in “Godzilla” (1984) is one in which organisms parasitizing Godzilla were mutated by radioactivity. Where are the creatures? The name of the ESP girl who plays Megumi Odaka who will appeared from the movie “Godzilla vs Biollante” (1989) until “Godzilla vs. Destoroyah” (1995). What title of the theater trailer of “Godzilla vs. Biollante” is correct? In which of the following does Godzilla appear in “Mothra vs. Godzilla” (1964)? Where is the country of Princess Salno in “Ghidorah the Three Headed Monster” (1964)? Where is the place where Rodan appeared in “Ghidorah the Three-Headed Monster”? What was the year when the Godzillasaurus was witnessed in “Godzilla vs. King Ghidorah” (1991)? Which of the following is the name of indigenous peoples that prospered on the earth in the ancient times in “Godzilla vs. Mothra” (1992) in which Keiko Imamura and Sayaka Osawa played. In “Godzilla vs MechaGodzilla” (1993) which of the following was the place where the headquarters of the United Nations Godzilla organization “G Countermeasure Center” was established?